"We've no alternative. 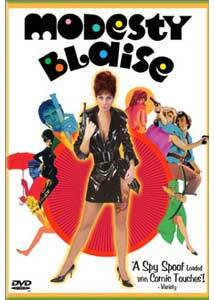 We must have Modesty Blaise." Someday, some poor misguided graduate student is bound to write a dissertation about the early film influences on the Austin Powers movies, and will come sooner rather than later to Modesty Blaise. Pity that poor student busily scribbling notes in the dark, because in the search for pedigree and relevance, he or she is going to miss out on what's pretty much just two hours of silly fun. The lovely Monica Vitti plays the title character, and if you've had your doubts about her acting ability from her many performances in Antonioni films, this movie will not assuage your reservations. Modesty, an espionage agent nonpareil, is apparently resolutely British, so little or no regard is paid to Vitti's Italian accent, and happily the script usually doesn't give her more than four or five words to say at a time. Modesty's big trick is that she can change her hair color and her clothes at will, but anybody who can't recognize that Monica Vitti as a blonde and Monica Vitti as a brunette are the same person had better call the ophthalmologist's office right away. And without getting too political, what with the blatant sexism of so many of the spy pictures of the period, it's great to see a woman on top—but given Vitti's obvious limitations as a performer, despite being in the title role, here she really isn't that much more than a Bond girl. She's rather fetching in all those skimpy little outfits, though. Modesty enlists the aid of her frequent collaborator Willie Garvin, played by Terence Stamp at his most shagadelic. The unconsummated passion between Modesty and Willie runs through much of the movie—that is, when they're not offing bad guys; it even allows Stamp and Vitti to sing (badly) together on more than one occasion. The song is truly terrible, but like a lot else here, you'll hang with it—there's a what-the-hell-why-not quality to much of the movie, and while some of the choices don't pay off (especially the strange voice-overs from Modesty's superiors, apparently commenting on the action), they're of little or no consequence to the audience's having a good time. The film is based on a British comic strip of the period, and I can't help but think that there's a whole level of fun and camp that we're missing out on by not being familiar with the source material. Think of Jack Nicholson in the first Batman movie—he's ripping it up and he's fun, but there's a whole other level of laughs if you've read the comic books or grew up watching Cesar Romero as the Joker. Image Transfer Review: The colors have faded some, but the production design still looks pretty glorious. A good number of scratches and even the occasional missing frame hamper the overall video presentation. Audio Transfer Review: The stereo track is the way to go, but both it and the monaural ones carry a good deal of crackle. Dynamics on the peculiar voice-overs seem a little askew, as well, but then, this isn't a movie during which you'll be hanging on every word. Extras Review: A generous number of chapter stops and English and Spanish subtitles are, unfortunately, the only extras provided. Smashing, baby! The winning spirit of Modesty Blaise is close to irresistible, and though the story isn't exactly galvanizing, the riotous production design and the general good time on the screen will probably keep you with it.